USD Board Chairman Don Knauss and wife Ellie, both far left, USD President James T. Harris III and Business School Dean Jaime Alonso Gomez pose with a rendering of the new School of Business Complex. 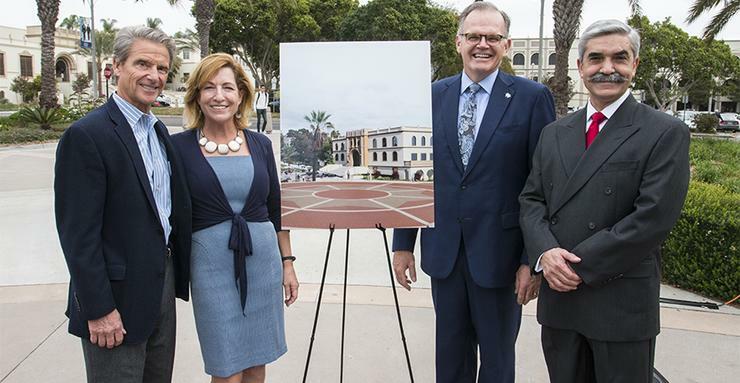 University of San Diego President James T. Harris III announced a leadership gift to the university from USD Board Chair Donald (Don) R. Knauss and his wife, Ellie Knauss, to launch the final planning and construction of a new USD School of Business Complex. At today’s ceremony announcing the Knausses’ leadership gift, President Harris noted that the gift is the largest donation ever received by USD’s School of Business. The new facility, which will be named for Don and Ellie Knauss, will be located adjacent to the school's current headquarters, Olin Hall. Following construction of the new building, the two structures will comprise a consolidated business school complex. School of Business Dean, Jaime Alonso Gomez, was ecstatic. 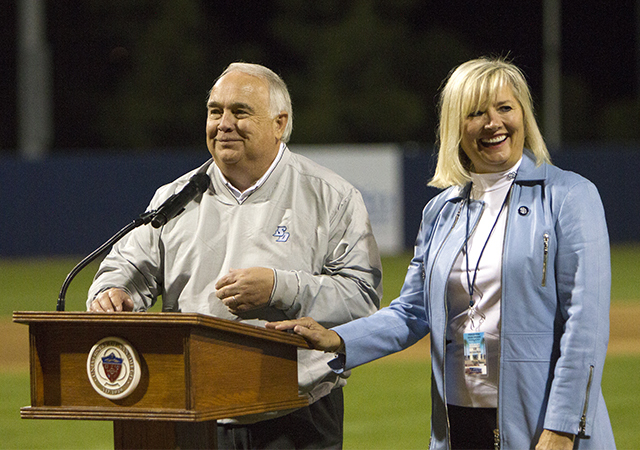 The Knausses’ gift will be leveraged to raise additional funds and financial resources for the complex, which will expand the School of Business footprint at USD from the existing 48,000 square feet to more than 120,000 square feet. The project is expected to cost approximately $67 million and be completed in 2022. 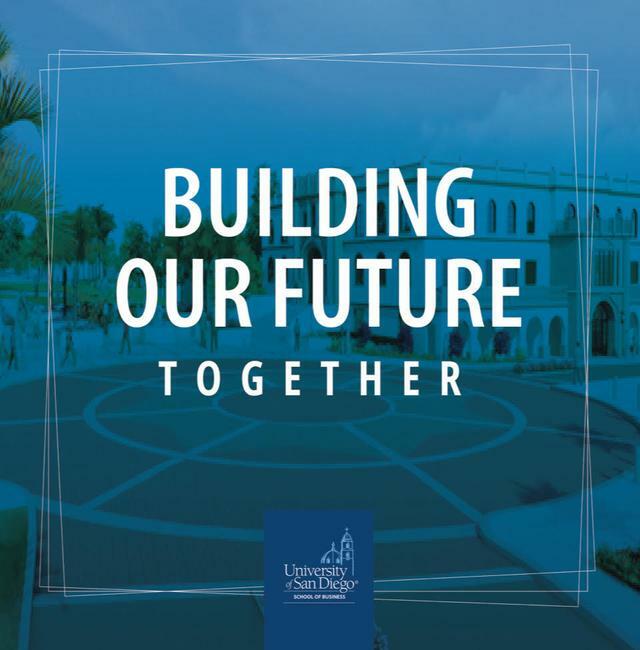 This investment, Knauss noted, occurred for three reasons: "A strong belief in USD’s mission of developing leaders who are dedicated to ethical behavior and compassionate service to others, most notably the people at USD who are committed to fulfilling the mission. Second, a belief in a free enterprise system that requires a creation of wealth and that it is done on an equitable and fair playing field so that everyone, regardless of background, has an opportunity to maximize their God-given talents and to create that kind of path forward in business and for business leaders. 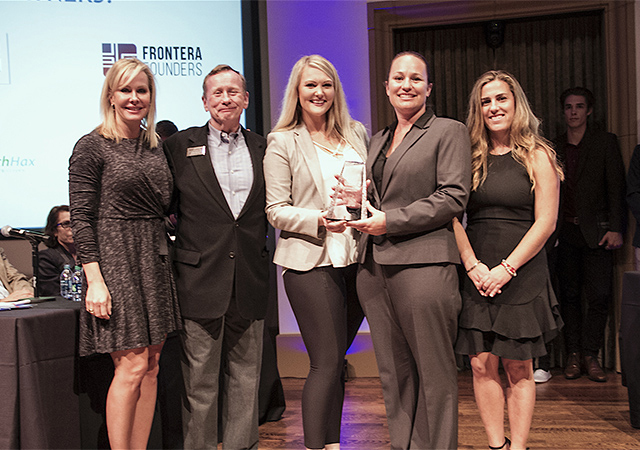 And third, a belief that the School of Business, with Dean Gomez’ leadership, a world-class faculty and staff can really create the kind of servant business leaders that will ensure that the system works for everybody." Mr. Knauss joined the USD Board of Trustees in 2008 while serving as Chairman and Chief Executive Officer of The Clorox Corporation. He retired from The Clorox Company in 2015 after serving as Executive Chairman of the Board from November 2014 until July 2015. As CEO, Knauss had overall responsibility for directing the company’s worldwide business which generated revenues of $5.6 billion in fiscal year 2014. Prior to The Clorox Company, Knauss spent 12 years with The Coca-Cola Company where he served first as Executive Vice President and then President and Chief Operating Officer for Coca-Cola North America from February 2004 until September 2006. Prior to his employment with The Coca-Cola Company, he held various positions in marketing and sales with PepsiCo, Inc. and Proctor and Gamble, and served as an officer in the United States Marine Corps. A native of Highland, Ind., Mr. Knauss serves on the boards of several public and private organizations, including McKesson Corporation, Target Corporation, U.S. Marine Corps University Foundation, Morehouse College, the Grocery Manufacturers of America, the National Collegiate Athletic Association, Kellogg Company, and URS Corporation, and the Indiana University dean’s advisory board, College of Arts and Sciences. He also serves on the Economic Advisory Council at the Federal Reserve Bank of San Francisco. The Knausses are proud parents of four children, including one who is a 2011 USD graduate.